Bloggers – Your Country (Skills Blog) Needs You! I’m still looking for a handful of volunteers for Kate’s Big Country Skills Bacon Challenge! 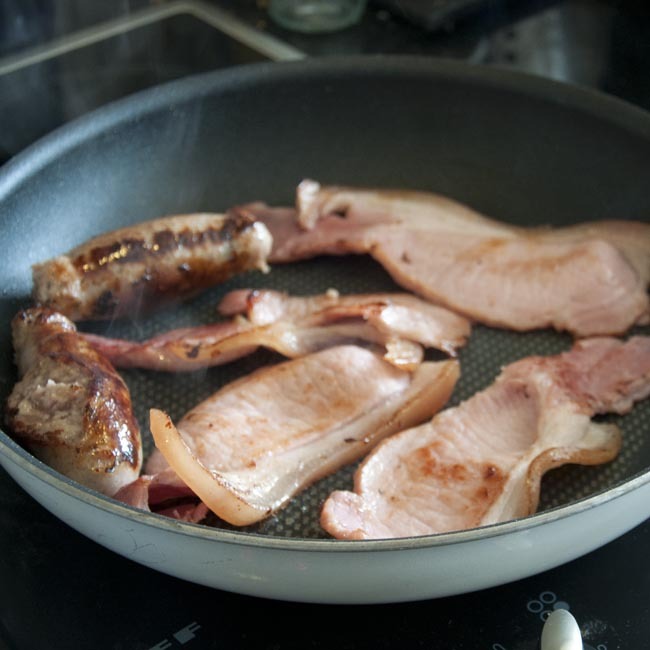 If you want to try something new and very cool – making your own bacon at home – and have a UK postal address, get in touch, and I’ll provide the curing salt. Then, just brag about your bacon wherever you blog and to whoever will listen! Thank you everyone, I now have a full set of volunteers! Instructions, and hopefully feedback, coming soon! Finally – Kate’s Big Country Skills Bacon Challenge is here! I love home-cured bacon, and I think you will too! The experience of making streaky bacon for the first time was one of the main motivations behind setting up this blog, and more recently I’ve had great success with home-cured back bacon, too. And yet despite how simple it is, and how wonderful the final product, the most common reaction I get is ‘Oh but that sounds very complicated, you’re braver than me!’. In order encourage as many people as possible to try this simplest of all foody experiences, I’ve come up with the following, very simple plan. I’m calling it ‘Kate’s Big Country Skills Bacon Challenge’. I will post an 80g pack of ‘Supracure’ curing salt (enough to cure up to 1kg of bacon) to the first 10 people to send me their UK postal address. Then, I’ll post day-by-day instructions to follow. That’s it, simple as that! All I want from you in return is to make your bacon, and to write about it, take photos of it, tweet about it, post to facebook about it and generally brag to anyone who’ll listen about how awesome, easy and worthwhile it is! With any luck, for some of you it may even become a habit of a lifetime. In order to make your very own bacon, you will need to provide a piece of fresh pork belly or pork loin up to 1kg in weight (ideally with the skin on), a non-metallic dish big enough to hold the meat, ~20g of sugar (soft dark sugar is best), some cling film, a refrigerator, and a couple of minutes a day for five consecutive days. I love hearing from my blog readers, especially if you’ve tried out something I’ve written about! After I wrote my butchery tutorial ‘how to portion a chicken’, blog reader asciiqwerty contacted me to me to let me know how she’d got on following my instructions, and sent me this photo of her finished portioned chicken. 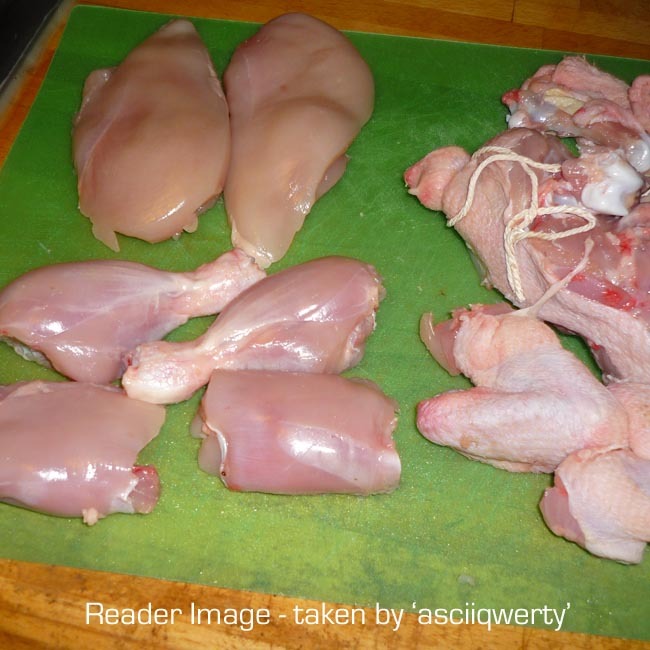 This time the portions have all been skinned, and the thigh portions have the bones removed – this would make them great for using in a stir-fry or a curry. She commented particularly on the size of the chicken breasts – which weighed in at about 200g each. A supermarket pack of two chicken breasts will usually be about 250g in total, so you can see how much more you get for our money. Well done asciiqwerty, and I hope it was as tasty! Moving away from food, back at Christmas I made hyacinth bulbs with hydrogel beads, in recycled jam-jars, as gifts for friends and relatives. I kept one for myself, of course, and thought you might like to see how it all worked out when it came into flower a few weeks ago. The smell was amazing, and after this flowerhead died back and I cut it down, the bulb produced a second unexpected bonus flower! 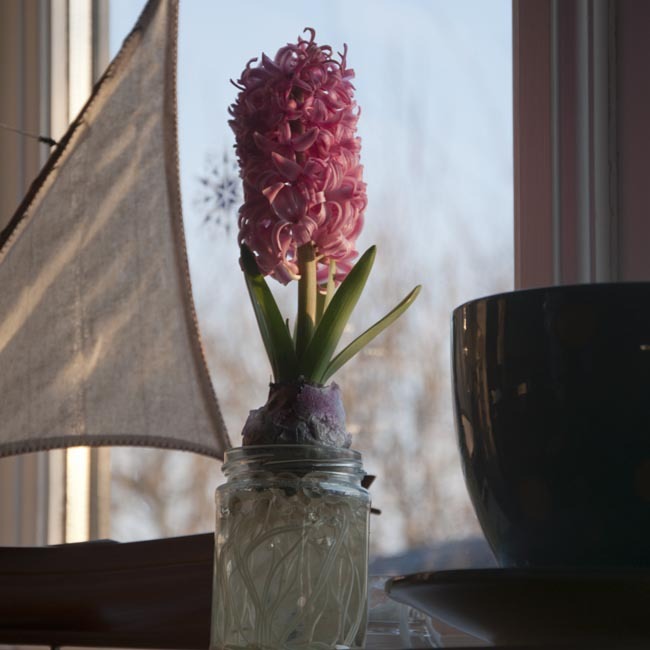 The hyacinth stayed nice and compact and didn’t fall over despite not being secured by anything other than the roots in the jar of beads, which I was very pleased with. Finally, the recycled chunk candle I made a few weeks back. I was amazed with this, it turned out so much better than I’d anticipated. 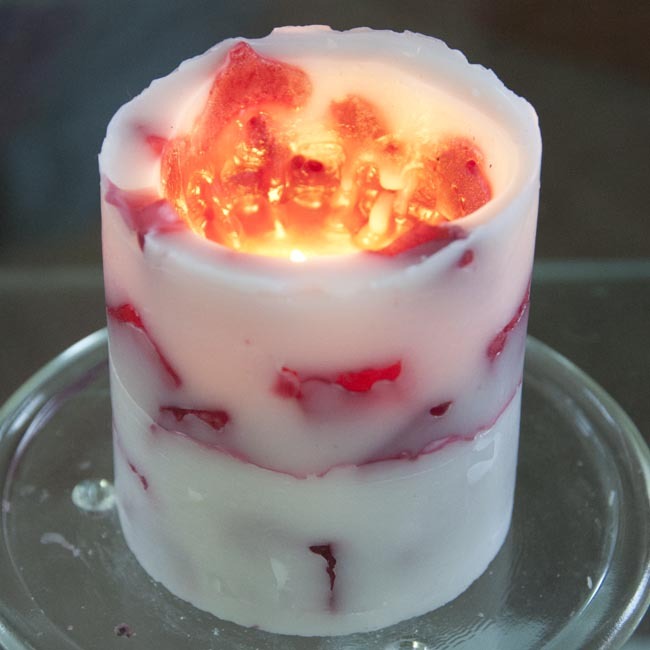 After looking initially as if the melt pool would be a bit pathetic in the centre, it actually burned down very nearly edge-to-edge leaving a thin shell which the candlelight flickered through like stained glass. I burned it every night for several hours after work, and it lasted a whole fortnight – I’d estimate around 45 hours burn time. I’d love to hear about any successes (or otherwise!) you might have had trying out country skills – either in the comments, @countryskills on twitter, or by email at countryskillsblog@gmail.com. Or perhaps there’s something you do that you think I should try – I’m always happy to hear new ideas, so please get in touch! Home cured streaky bacon has been a constant fixture in my house since I first made it back in October – in fact I’ve not bought any ‘commercial’ bacon since. Back bacon used to be our house favourite though, before I started curing. A couple of weeks ago I saw a tied pork loin ‘roasting’ joint for sale half-price in the local co-op, and it seemed to good to refuse. 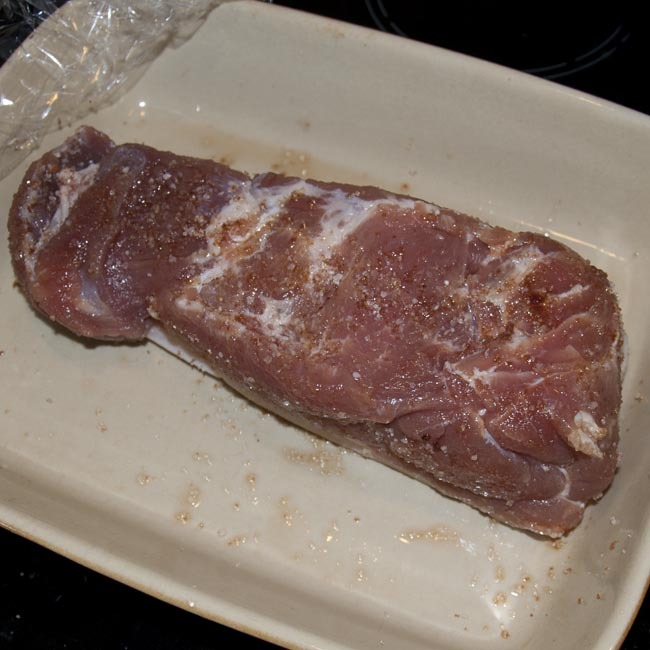 A piece of pork loin. The roasting joint was a bit big so I cut it in half to give me a piece about 650g in weight. A non-metallic dish big enough to contain the meat, and some cling film to cover. That’s it – I wanted to keep the first effort as simple as possible! Weigh out the cure ingredients and mix them together well. 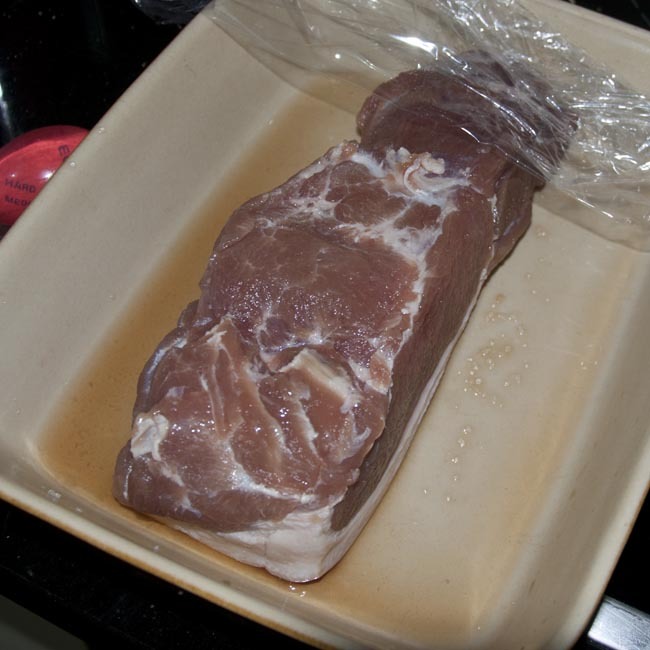 Now rub about a quarter of the cure mix all over the pork, including on the skin. You can see it start to draw out moisture from the meat straight away. Cover the dish loosely with some cling film, and put it in the fridge until tomorrow. The next day, there will be some liquid in the bottom of the dish. 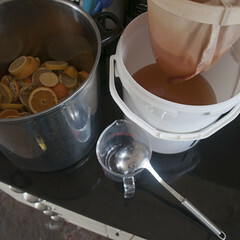 This is the ‘pickle’ and is made up of some of the curing mix dissolved in the liquid that’s been drawn out of the meat. It’s completely normal, so don’t worry. 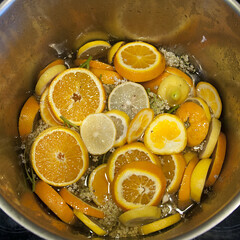 Pour it away, or your dry-cure will pretty quickly turn into a brine cure. Now take about a quarter of the remaining cure and rub it all over the meat again. Put it back in the dish the other way up to last time (so skin side up, if you started skin-side down). Repeat this process for another three days (so that you’ve rubbed cure into the bacon five days running). By day 3 you should notice a distinct difference in the texture of the meat, it will be firmer in consistency and a bit darker pink in colour. 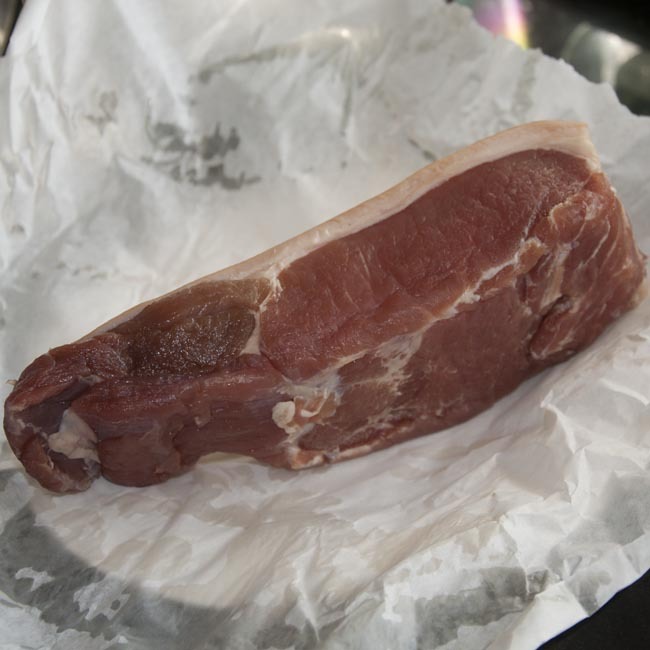 On the sixth day (so one day longer than the streaky bacon process – this is because the meat is thicker than belly pork), remove the bacon from the dish, rinse it under the tap, dry it carefully with kitchen towel, wrap it loosely with greaseproof paper and put it back in the fridge. Ideally, wait a couple of days before you start eating it, do let it rest at least overnight. 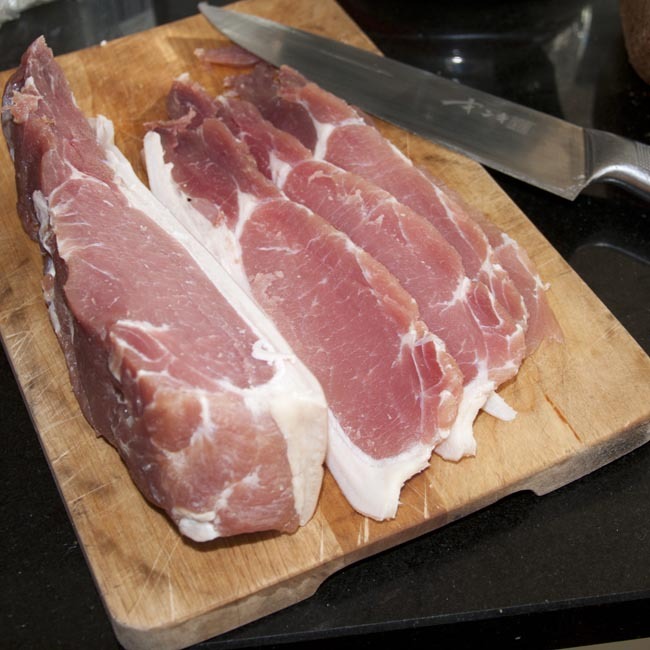 Then slice your amazing bacon with a sharp knife, and cook however you prefer. I like to pan-fry my back bacon. 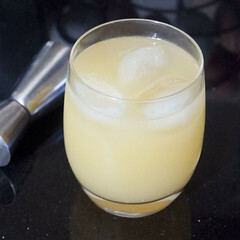 This one is gorgeous and I can only heartily recommend you make some for yourself! 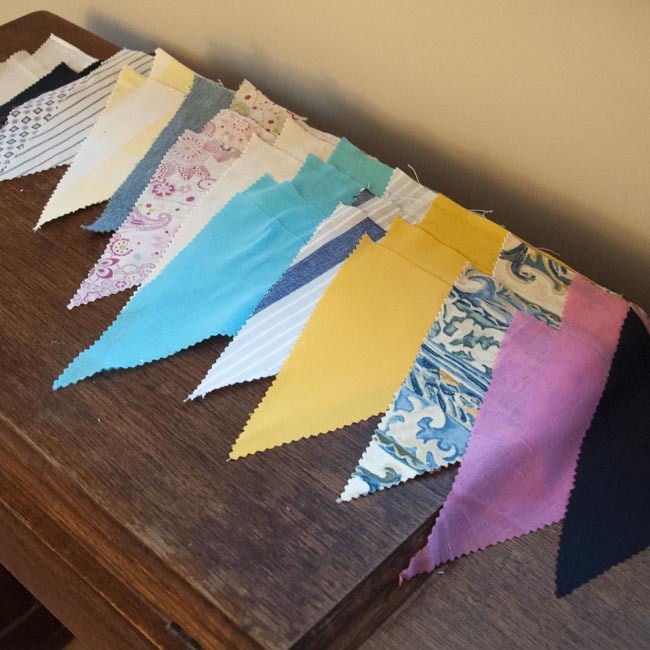 That Wedding Bunting – now well underway! 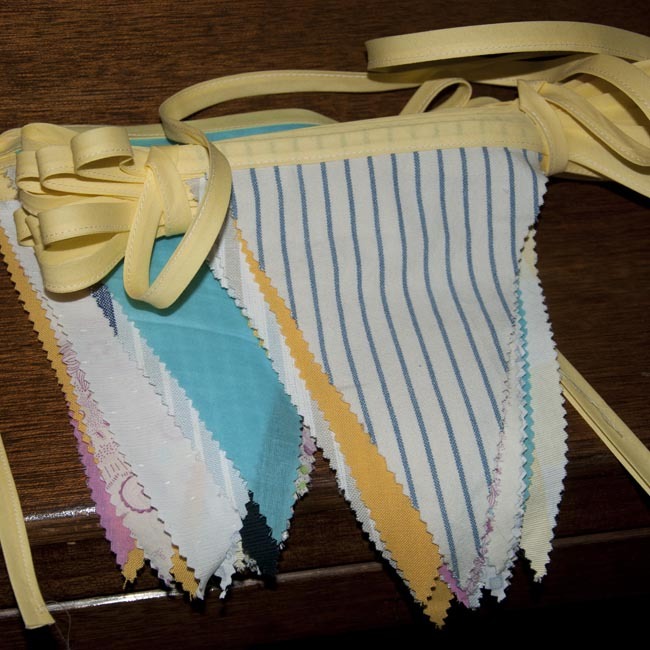 The quick and simple Christmas Bunting was only ever a dry-run for the big task – I’d promised my sister bunting to decorate the village hall for her wedding reception. Time is ticking on, so I’ve been getting on over the last few weeks. 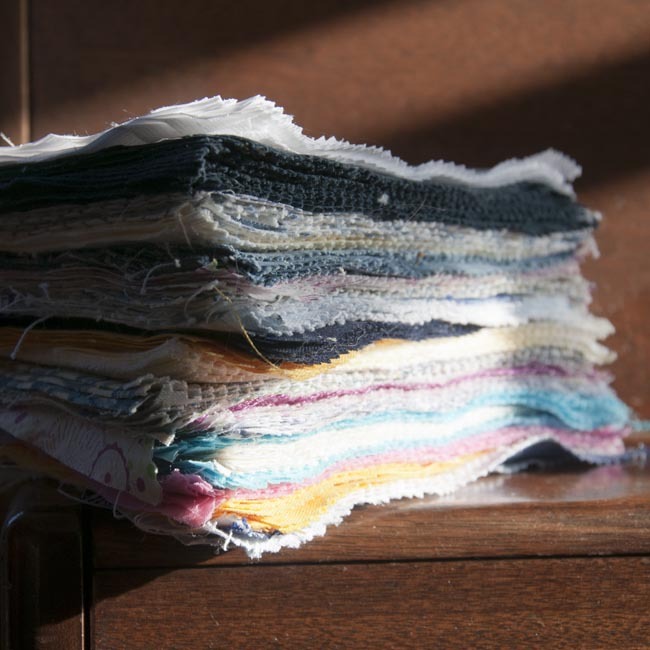 My plan was eventually to make 6 strings of 10m length each, in pursuit of which I’ve begged, borrowed and not *exactly* stolen all manner of fabric scraps, old clothes and bits and pieces. I also bought a 72 yard bolt of yellow double-fold bias tape from the US via the marvel that is ebay. This time I’ve chosen a bigger pennant, 8″ long by 6″ across. I’ve also tightened the spacing so there is 6″ between flags. It’s a great selection of colours and patterns, garnered from friends, family, work colleagues, the back of my wardrobe, and freecycle. 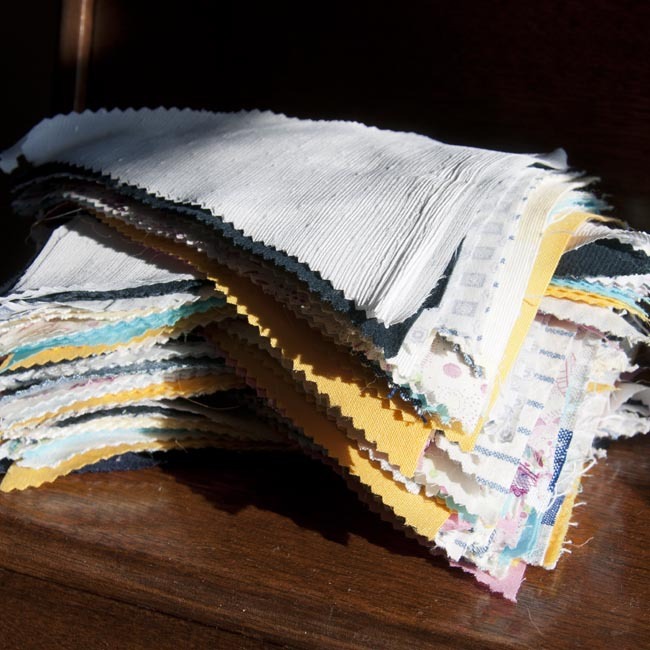 The fabrics come from three sets of curtains, three blouses, a pair of jeans and a pair of cords, one pair of jim-jams, two offcuts of woollen suit fabric, some polyester scarf material, and one tea towel. A bit of back-of-envelope calculation and I worked out I needed 29 flags per string. I drew a new template on cardboard from a packing box. Words cannot express what a slow boring job cutting out 180 triangles is, but with perseverance, and sat cross-legged on the floor in front of the telly evening after evening, we got there in the end. After ironing and sorting into piles, time to assemble the bunting. Bias tape has quite a lot of ‘give’ in it, so peel a load off the roll and give it all a good stretch, this will also help it lie flat. I measured 10m lengths and then found the middle of each. 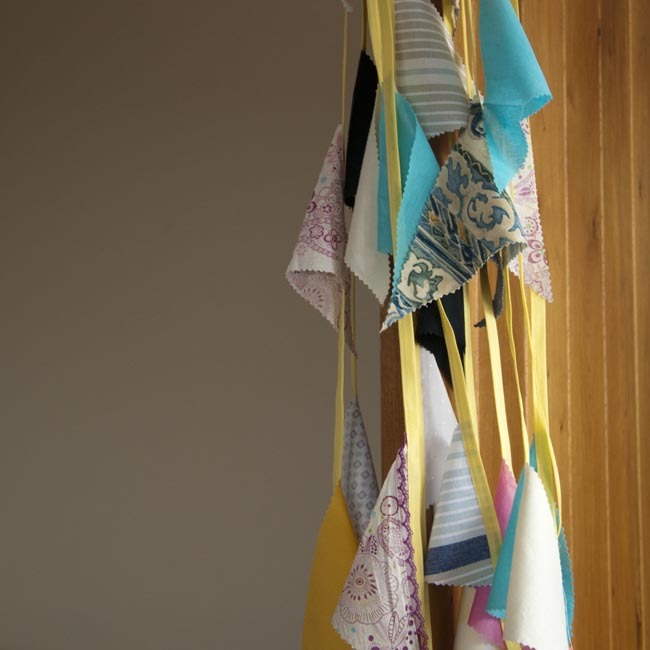 Then starting in the middle, pin the pennants one at a time into the fold of the bias tape, measuring the gap between them approximately. After that, it’s just a matter of running the whole length through your sewing machine using appropriate complimentary – or if you like, contrasting – thread. Try to avoid skewering your fingers on the pins too often. There it is – I hope she likes it! Only four more strings to assemble before it’s all done! Nothing beats a really fresh free range egg. For breakfast, fried or poached, boiled or scrambled, or for lunch in an omelette, a really fresh egg – preferably laid this morning – is head and shoulders above any other egg you’ve ever tasted. You can see the difference straight away, even before you crack it – the shell may well be a bit grubby, and a slightly funny shape, an unexpected or uneven colour. When you crack it open, the egg white is firm and ‘sits up’ in the pan, and the yolk is a deep orange, and bigger than you expected – if beaten, the raw egg is a rich dark yellow, rather than off-white. In your mouth the yolk is velvety and rich, creamy and almost sweet with a luxuriant almost-custard quality and the white is firm but never rubbery – a million miles away from the flaccid anaemic and tasteless output of battery cages and the supermarket supply chain. It’s a sad fact that in the supermarket dominated, urban West, most people have probably never tasted a really good, fresh egg. We think of eggs as being uniform, sized and graded, cheap and frankly, dull. But they’re a natural product, and they vary – in size, colour and shape – and from the very firmest, freshest example, to the end of their storage life when the egg white is watery and the best of the flavour is gone. I said nothing beats a very fresh egg, but of course that depends what you’re doing with it. If you want to beat the egg and use it to help with raising – in baking, or a soufflé – or you want hard boiled eggs peeled for a Salade Niçoise, then the very freshest eggs aren’t for you. The egg white – the albumen – is actually in two parts. The outer albumen is quite watery, you can see it spread out in the pan in the photo above. The inner albumen is much more firm in a very fresh egg (but in an egg which has been stored for some time you probably won’t be able to see a distinction between the two). In a very fresh egg this inner albumen has too much structure and tends to want to hold together, which doesn’t allow the batter to rise properly. Furthermore, if you hard boil a really fresh egg and then remove the shell, the outer albumen will come away with the shell, which is a waste and makes for a scruffy-looking boiled egg. Eggs about a week old are best for baking and hard boiling – realistically you won’t get eggs much fresher than this from the supermarket, though. 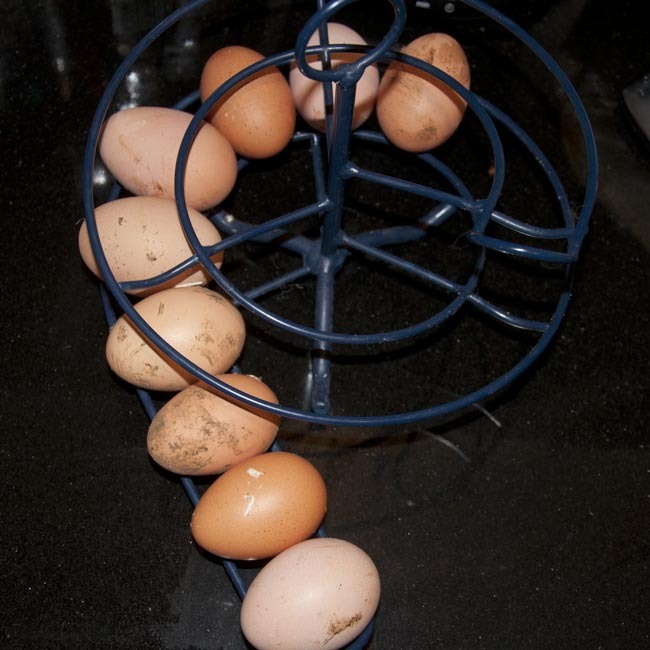 These are my eggs, and three things are obvious – first the range of shapes and sizes, secondly that they’re in some sort of wire device (it’s called an Egg Skelter, and I wouldn’t be without it) and not in the fridge, and thirdly that, frankly, they’re a bit grubby! The size variability is something that you have to make adjustments for with ungraded eggs. My approach is to weigh them and then adjust according to standard size references. The Lion Egg Scheme people have a size guide here. Fresh eggs will keep safely at room temperature for 3 weeks (it’s no coincidence that this is the length of time they have to stay ‘fresh’ under a warm hen if being hatched! ), but if you do put them in the fridge, then you need to leave them there. 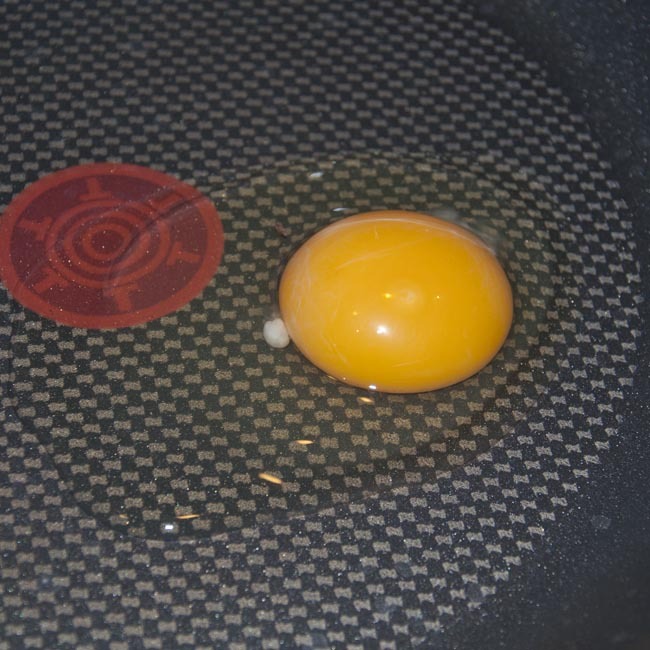 If eggs are removed from refrigeration, moisture condenses on the outside of the shell and can then be drawn through into the inside of the egg by osmosis, potentially pulling pathogens from outside the shell into the egg itself and increasing the risk of food poisoning. My eggs don’t sit around for anything like three weeks (if I have a glut I know plenty of people who are happy to help me deal with it!) so storage at room temperature is ideal. Better still, the egg skelter enforces first-in-first-out use, which is trickier with other storage systems. So you’d think washing the dirt from the outside of the egg would be a good idea, right? In fact dissolving these contaminants in water, and disrupting the outside surface of the shell, also increase the risk of pathogen entry. Much better to leave grubby eggs as they are, and rub off any loose dirt and mud from the surface just before use. Egg washing is not permitted in the production chain for commercial shell eggs in the UK, on a risk assessment basis, though it is common practice in other countries including the US (they tend to wash in a chlorine solution – because bleach is what you want in your eggs!). This goes some way to explaining the obsession with clean eggs in intensive production systems – and the resulting battery cages (improved, but not yet gone), as ‘dirty’ eggs are downgraded. I’ve kept hens for two and a half years now. I wasn’t expecting get as attached to them as I have, they’re fascinating animals. Funny feathery little dinosaur-descendants they certainly are, they’re inquisitive, social (and not always sociable!) little creatures. Only when you’ve watched hens scratch around for bugs, enjoy a bit of a flap and a wing stretch, and then settle down into a well-earned and apparently thoroughly indulgent dust bath, can you really start to understand how inhumane intensive cost-led egg production systems are. 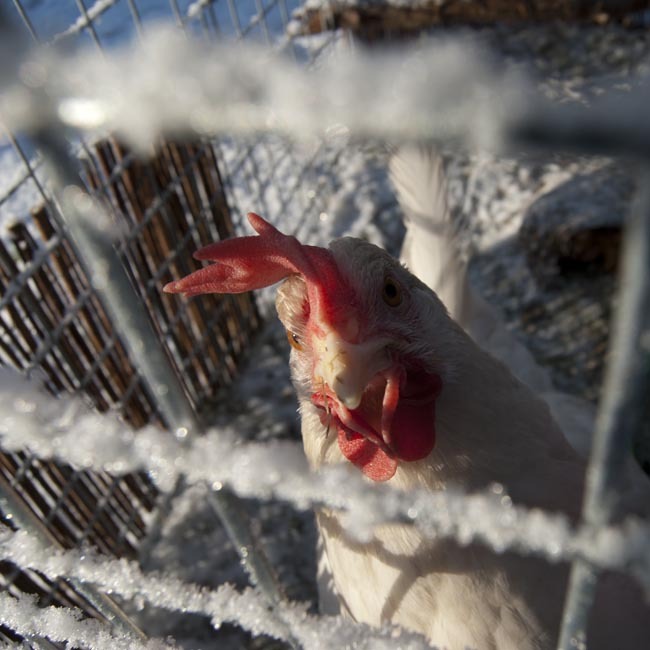 This is Gertie, by the way, my ‘top hen’, being a bit confused by her first sight of snow, and wondering what I’m doing with that camera. You may not be able to keep your own poultry, but if only for the sake of your palate (never mind the quality of life of the poor intensive egg-producing bird) it’s worth seeking out the best and freshest outdoor reared eggs you can find – farmers markets and farm shops are a great place to start – or ask around, you may be surprised to find a colleague keeps backyard hens, and if you’re really super nice to them, they may be prepared to share! Then, enjoy your wonderful, freshest eggs, with the best home cured bacon for the most amazing breakfast fry-up you’ve ever tasted.